Abstract. Southern West Africa (SWA) is undergoing rapid and significant socioeconomic changes associated with a massive increase in air pollution. Still, the impact of atmospheric pollutants, in particular that of aerosol particles, on weather and climate in this region is virtually unexplored. In this study, the regional-scale model framework COSMO-ART is applied to SWA for a summer monsoon process study on 2–3 July 2016 to assess the aerosol direct and indirect effect on clouds and atmospheric dynamics. The modeling study is supported by observational data obtained during the extensive field campaign of the project DACCIWA (Dynamics–Aerosol–Chemistry–Cloud Interactions in West Africa) in June–July 2016. As indicated in previous studies, a coastal front is observed that develops during daytime and propagates inland in the evening (Atlantic inflow). Increasing the aerosol amount in COSMO-ART leads to reduced propagation velocities with frontal displacements of 10–30km and a weakening of the nocturnal low-level jet. This is related to a subtle balance of processes related to the decrease in near-surface heating: (1) flow deceleration due to reduced land–sea temperature contrast and thus local pressure gradient, (2) reduced turbulence favoring frontal advance inland and (3) delayed stratus-to-cumulus transition of 1–2h via a later onset of the convective boundary layer. The spatial shift of the Atlantic inflow and the temporal shift of the stratus-to-cumulus transition are synergized in a new conceptual model. We hypothesize a negative feedback of the stratus-to-cumulus transition on the Atlantic inflow with increased aerosol. The results exhibit radiation as the key player governing the aerosol affects on SWA atmospheric dynamics via the aerosol direct effect and the Twomey effect, whereas impacts on precipitation are small. How to cite: Deetz, K., Vogel, H., Knippertz, P., Adler, B., Taylor, J., Coe, H., Bower, K., Haslett, S., Flynn, M., Dorsey, J., Crawford, I., Kottmeier, C., and Vogel, B.: Numerical simulations of aerosol radiative effects and their impact on clouds and atmospheric dynamics over southern West Africa, Atmos. Chem. Phys., 18, 9767-9788, https://doi.org/10.5194/acp-18-9767-2018, 2018. Highly resolved process study simulations for 2–3 July are conducted with COSMO-ART to assess the aerosol direct and indirect effect on meteorological conditions over southern West Africa. 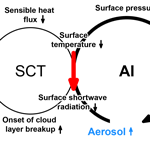 The meteorological phenomena of Atlantic inflow and stratus-to-cumulus transition are identified as highly susceptible to the aerosol direct effect, leading to a spatial shift of the Atlantic inflow front and a temporal shift of the stratus-to-cumulus transition with changes in the aerosol amount.